Servants of Christ. Stewards of the Mysteries of God. That's what Paul and his co-worker Apollos claimed to be. By God's grace, that will be what we today become. Something beyond worth was entrusted to the apostles. Something beyond comprehension was working in them. Shall we be found ultimately fit for the position? Paul was being subjected to severe scrutiny, and more than that, by the Corinthians. He knew however, as we too ought to know, that only God ultimately judges. And by what standard? "Nothing beyond what is written." Paul doesn't say where written, but it is clear what he can only mean--written in the Scriptures. Only the Scriptures define what the true measure of a person is. To claim worth beyond what the Scriptures say is truly worthy is to inflate ("puff up") one's merits. 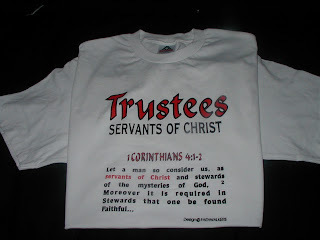 But the measure is being applied to a lowly servant; to one who is trusted with taking care while the master is away. Lord, guard us from making judgments of others. Keep us from accounting credit to ourselves for what we have done--especially if that "accomplishment" is reckoned by human terms alone. Make us mindful of the many ways in which we are entrusted to care for what you have given us. Bring us to a fuller comprehension of the mysteries of the life and love with which you have blessed us, and continue to bless us every day. Amen.